Villa Elvina is built on just a 70 metre distance from the beach of Drapanias village, located between Gramvousa and Spatha Capes of Kissamos Gulf in the northern part of Crete. 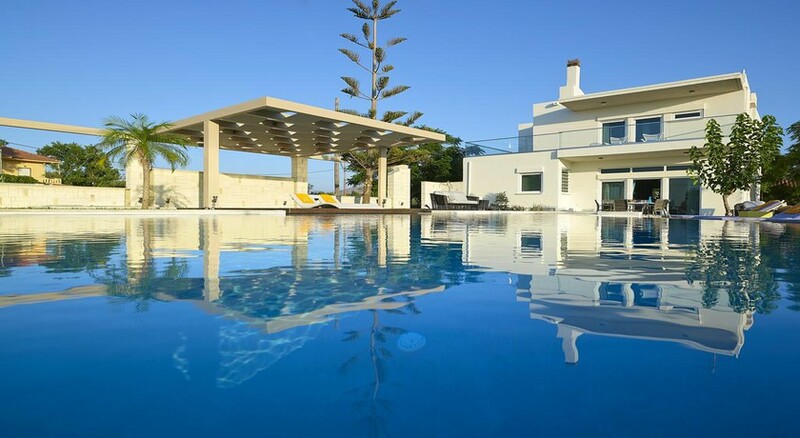 The villa is surrounded by a 3 acres outdoor area, which- in combination with its properly designed facilities covering a wide range of activities and catering to all visitors needs and tastes- render it an appealing form of accommodation. Villa Elvina enables all guests to enjoy their swim either in the 80 m2 pool (12 m2 for your children) or in the sea and relax by gazing at the magnificent sunset. Guests also indulge in their dinner under the vine arbour of a stone built barbecue overlooking the sea view or they can have the chance to enjoy a stroll around the trim garden any time. The villaâ€™s unique architecture whose major characteristic is its stunning sea view, along with a particularly subtle decoration of the interior, especially designed to cater a wide range of guests needs, is designated to offer fascinating experiences and moments of relaxation filled with sea, sun and rejuvenating fresh air. Villa Elvina is designed to accommodate both a group of friends and is also family-oriented. It consists of 2 floors and includes mainly open-air spaces so that guests can sense the feeling of fresh air and the sea breeze dominating all over the place. The pale colours, the discreetly decorated style of the interior as well as the modern and elegantly furnished rooms, supplement the general sense of relaxation. On the ground floor there is a huge, single integrated area which includes a spacious living room, a fireplace, a W.C., 2 dining rooms and a comfortable and functional kitchen. The buildingâ€™s large and plentiful windows and glass doors allow the light to enter the rooms rendering the house amazingly bright. The exterior of the villa is equally stunning. It is comprised of porches, stone-made sofas and furniture, suitable for both your relaxation and your indulging in your meals. 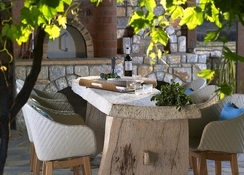 There is also a big stone-built barbecue situated under the cool, welcome shade of the vine arbour. At the front side of the villa there is a colourful garden, the lawn, the local wild vegetation and a kind of Mediterranean trees. In the middle of the garden an oddly-shaped 80 m2 swimming pool is constructed as well as a wooden deck and a pavilion are added to the surroundings to establish a harmoniously calm atmosphere. This luxury villa comprises of 4 bedrooms and can host up to 10 people (maximum 10 people) (2 of whom will be given a sofa-bed to sleep in). The largest bedroom is a 35 m2-studio type which is integrated into the villaâ€™s ground floor having a separate entrance door. The bedroom includes a double bed, a cosy, small living room, a kitchenette and a bathroom with shower. An elaborate wooden staircase leads to the first floor, where 3 separate bedrooms are to be found. One of them offers a double bed, a bathroom and a large furnished balcony overlooking both the sea and the swimming pool. The other 2 bedrooms have 2 single beds each which could be part together and form one bigger bed. Those 2 bedrooms share a common, furnished-porch as well as a roomy bathroom. All bedrooms are equipped with comfortable beds and mattresses, and with premium linens. 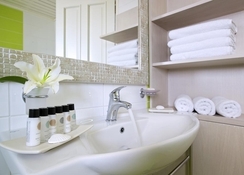 In the bathrooms there are bathrobes, bath towels for both face and body use along with hairdryers.